We encountered writing center work the way many in our profession do: first as students visiting the centers on our undergraduate campuses, then as tutors ourselves, then in graduate coursework on writing center theory and pedagogy, and later as professional practitioners. Our experiences with writing center work during our education and careers have shaped us as, you might say, writing center natives. We (Russell and Meghan) proudly claim our native status-brought up on the process-centered, collaborative approach to writing. Unlike contemporary writing center clients, however, we cannot claim to be what Marc Prensky calls digital natives, "'native speakers' of the digital language of computers, video games, and the Internet" (1.). Coming from a doctoral program in Texts and Technology, we both may be early adopters but remain "digital immigrants" nonetheless, for we were not "born into the digital world," as Prensky says (1). 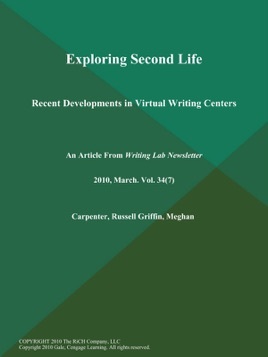 Yet as we work to keep our writing centers responsive to a student body that is increasingly savvy with technology and in some cases geographically dispersed, we look to electronic spaces to explore: new options for writing; center practice. The "virtual world" called Second Life (1) offers such an opportunity. The Gale Group, Inc., a Delaware corporation and an affiliate of Cengage Learning, Inc.